This beer is for the grown folks. The word wheat might throw you off a bit because this is not a beer that wheat lovers are looking for. I’d like to give Surround to an unsuspecting wheatie and see their reaction, although I’m sure the color alone will tip them off. It’s as dark as they come with my phone light barely penetrating the beer any measurable amount beyond a couple of millimeters. This beer is malty, stouty, syrupy, rich, and a little bit chocolaty, (and not so wheaty). So many big flavors in there I could go on for at least a whole-nuther paragraph. This taste can be summed up by saying, “Oak smoked imperial wheat stout,” and by Jove its printed right there on the side of the bottle. No real surprises here. Honest beer for the connoisseur. Final overall happiness metric = 5 out of 7 smokestacks. Brewer’s Description Like a sound system that fills the room with audibles swarming in every direction. This massive stout overtakes your senses with aromas and flavor of dark chocolate, caramel, roast, smoke, earth, and wood. It’s heavy I know, but you have to drop that bass every once in a while if you really wanna get down. For some clarity on the backstory of the label, see this link below. 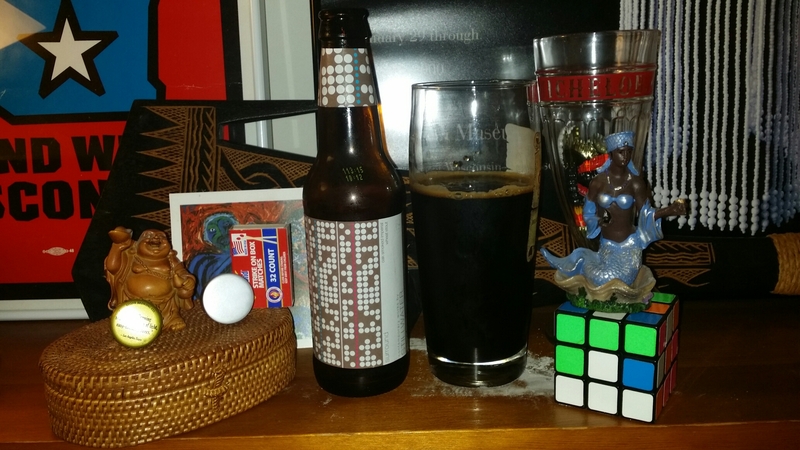 This entry was posted in Beer, Educate, Enlighten, rauchbier, Smokebeer and tagged 5 - 6, boozy, imperial, Maryland, oak, Stillwater Artisanal, Stout, wheat. Bookmark the permalink.